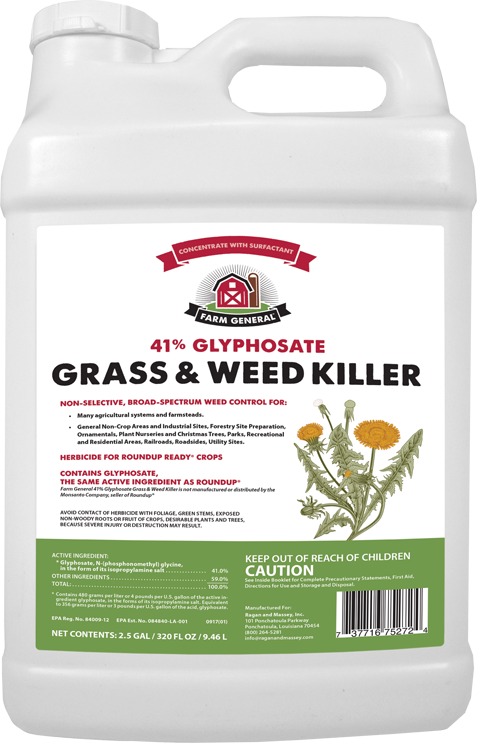 Farm General 41% Glyphosate Grass & Weed Killer is a non-selective, broad-spectrum herbicide for agricultural, residential and industrial use in non-crop areas. It’s been used in forestry site preparation, at plant nurseries, and along roadsides and railroads as a way to keep the plants you want and kill every plant you don’t. This post-emergent herbicide controls over 150 annual and perennial weeds, woody brush, vines, and trees within days of application with no residual soil activity. Perfect for large-scale application and Roundup Ready® crops, it may be mixed with ammonium sulfate, drift control additives, and dyes. For a full list of targeted species and spraying instructions, please see the COMPLETE LABEL. Please see label for full precautionary, application, mixing, and storage instructions.